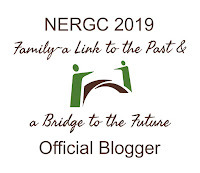 For this week's 52 Ancestors in 52 Weeks writing challenge from blogger Amy Crow Johnson of No Story Too Small, the theme is Black Sheep. 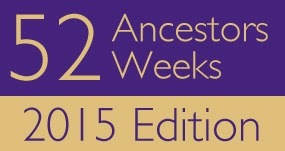 For each of the first nineteen weeks of this challenge, I have had success writing about a direct ancestor. For this theme, I thought I would write about my grandfather Pyle's second wife. Feroll Moore was born in High Springs, Alachua County, Florida, on August 9, 1900, to Augustus and Cleone Moore. I find her in the 1910 U.S. Census with her family in Jacksonville, Florida, and in 1920 in Clearwater, Florida. By 1930, Feroll Moore is a lodger in New York City, with occupation of "Manager, Hotel." 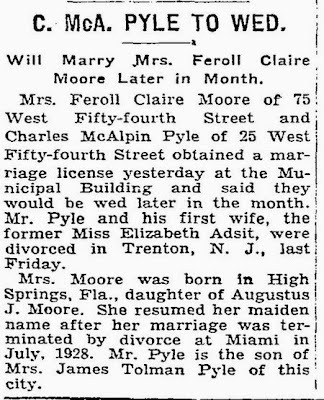 I don't know how they met, but in August 1933, Feroll Moore married my grandfather, Charles McAlpin Pyle. According to a brief wedding announcement in the New York Times, Feroll had already been married and divorced, but I haven't found details of that. 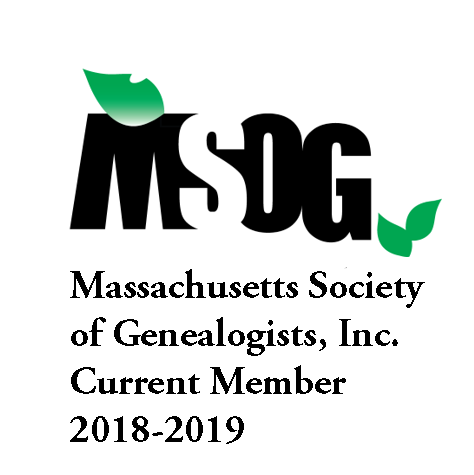 Ancestry.com, Historical Newspapers, Birth, Marriage, & Death Announcements, 1851-2003. 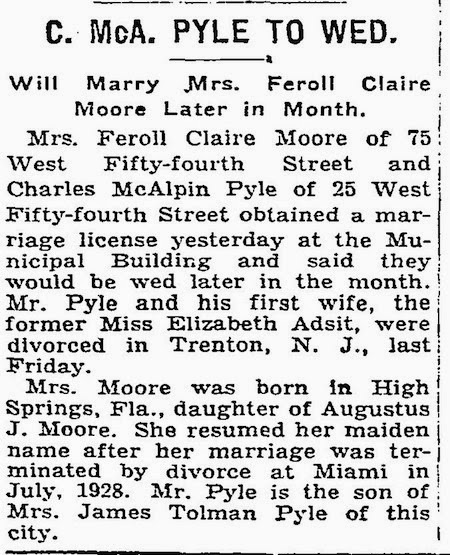 Record for Charles McAlpin Pyle and Feroll Claire Moore, New York Times, p. 15, 15 Aug 1933. This marriage didn't last long. By 1940, Charles and Feroll had separated, and in June 1941, their divorce was finalized. Supposedly in 1941, Charles married his third wife, Lucy (though I'm still looking for a primary source for that fact.) Charles died on August 17, 1966, in Washington, D.C. leaving his wife Lucy and my father as his heirs. In my collection of family history materials, I have an envelope of documents, letters, and notes from 1967, the year after my grandfather Pyle died. I have the official June 1941 divorce agreement with Charles Pyle, plaintiff, and Feroll M. Pyle, defendant, which includes a copy of the February 5, 1941, separation agreement detailing Charles's financial support of Feroll. Grounds of the divorce: On January 17, 1940, Feroll "wilfully [sic] deserted and absented herself from the plaintiff, and from the home of the plaintiff and defendant, which at that time was at Burleigh Manor, State of Maryland, and has continued to desert and absent herself from the plaintiff ever since said date, without reasonable cause." I find her in the 1940 U.S. Census (taken as of April 1, 1940) in Manhattan. Charles remained in Ellicott City, Maryland (and is there for the 1940 census enumeration). The February 5, 1941, separation agreement, quite generous on the part of my grandfather, detailed the several sources of Feroll's income: (a) She would receive one quarter of the income that Charles was receiving from Pyle family trusts established by his mother, Adelaide (McAlpin) Pyle; (b) she would receive half of the proceeds of the sale of their home, Burleigh Manor; and (c) a $25,000 insurance policy designated Feroll as beneficiary and both would continue to pay half the premiums on it. On March 2, 1941, Charles moved to Hot Springs, Arkansas, in order to establish residency there, and in early May, when he had lived there for more than 60 days, he filed for divorce. Less than a week later, Feroll was on board the S.S. Coamo heading to Puerto Rico, where she remained until returning to New York from Puerto Rico (with her mother) to New York City on July 21, 1941. It is from these passenger lists (one of which is below) that I confirmed her birth date. Year: 1941; Ship: Coamo; Record Group Number: 85; Line: 6. Record for Feroll Pyle. The divorce documents include depositions from Charles; from his friend, George Bayless; and from his landlord in Hot Springs, assuring the court that Charles had been a resident there from March 2, 1941, until the June 3, 1941, court date, enough time to establish residency in order to file for the divorce in Arkansas. "I have always felt the cause of this separation to be an effort on the part of Mrs. Pyle to force Mr. Pyle to give up his ideals for her way of life; failing this, she would force him to pay as much as she could possibly wring from him in order that she could follow her way of life." "On numerous occasions and in numerous ways Mrs. Pyle would belittle Mr. Pyle to his friends and neighbors, endeavoring to create the impression Mr. Pyle was of unsound mind, and so upset his business arrangements. On a number of occasions her underhand methods succeeded in causing Mr. Pyle's associates to deny their commitments with him." On June 3, 1941, in Hot Springs, Arkansas, Charles Pyle gave his deposition with regards to the divorce. The divorce was declared final on June 12, 1941. However, this was not the end of the troubles that Feroll Pyle caused for the family. After my grandfather died in September 1966, the trust payments to Feroll stopped and she received the proceeds from the insurance policy that had been put in her name twenty-five years before. When she realized that she was no longer receiving the regular trust income, she hired a lawyer to try to get the trustees to continue to pay her. She even went so far as to claim that she was still lawfully married to him at his death and therefore was his widow and heir to his estate. There was even a threat of a lawsuit. It is because of her attempt to claim the inheritance that these documents were saved and a great deal of additional paperwork was collected. The many pages of handwritten notes from the family lawyer (Paul Smart, husband of Sara (Pyle) Smart, and brother-in-law to my grandfather Pyle) include additional details like: "And I have personal knowledge - having drawn the Trusts - that Mrs. Pyle [Adelaide (McAlpin) Pyle] ... did not approve of the marriage of her son to your Client [Feroll Moore Pyle] whom she felt was responsible for the divorce of her son from the mother of Mr. Pyle's son [my father]." Because of my grandparents' 1933 divorce, my father had barely stayed in touch with his own father except for the last year or two of his life. He then had to deal with the claims of this "black sheep" of the family, his father's second wife that he likely never met, and only communicated with through lawyers. I have found that there is a FindAGrave.com memorial for Feroll Moore Pyle, that shows that she died in 1999, and is buried in Ava Cemetery, Douglas County, Missouri.